Editor’s note: This story has been updated to include a statement from Presiding Bishop Michael Curry in response to a statement from U.S. Attorney General Jeff Sessions. [Episcopal News Service] In mid-May, a Honduran man who crossed the U.S.-Mexico border into southeast Texas with his wife and 3-year-old son committed suicide at a county jail, where after requesting asylum, border agents told him he’d be separated from his family. Family separations aren’t just happening at the border, roundups are happening nationwide. In early June, in Seattle, Washington, 206 undocumented immigrants apprehended at the border and held in U.S. Immigration and Customs Enforcement custody – 174 of the women, at least half of them mothers – were transferred to a detention facility near the airport. Somewhere along their journey, the mothers were separated from their children. Some weren’t given the chance to say goodbye and could hear their children screaming in a nearby room; some don’t know their children’s whereabouts. Most, though not all, of the women fled ongoing gang and domestic violence in El Salvador, Guatemala and Honduras, three of the most violent countries in the world. Unaccompanied minors and families from Central America began arriving at the U.S.-Mexico border in record numbers in 2014. The numbers later dropped off, but there’s a new surge happening now at the Southwest border where Customs and Border Control agents have detained more than 252,000 people – 32,371 unaccompanied minors and 59,113 families – over the last eight months. There are some 11,000 unaccompanied minors in federal custody. On June 11, U.S. Attorney General Jeff Sessions further clarified the Trump administration’s immigration policy saying gang violence and domestic abuse are not grounds for asylum, overturning a precedent set in 2016 by the Department of Justice’s Federal Board of Immigration Appeals. In early April, Sessions announced that anyone caught crossing the border illegally or attempting to cross the border illegally would be criminally prosecuted. Then, on May 7, during a speech in San Diego, Sessions clarified the zero-tolerance policy, stating it includes separating children and parents. To carry out the new enforcement policies, Sessions sent 35 prosecutors to the Southwest and moved 18 immigration judges to the border. On June 7, Sessions quoted the Apostle Paul in Romans 13, using the phrase about “obeying the laws of government because they were established by God” in defense of the Trump administration’s family separation policy. On June 8, Presiding Bishop Michael Curry refuted Session’s claims. “For those of us who follow Jesus, his teachings are the final authority and Jesus said, ‘love your neighbor as yourself,’ (Matthew 22:39) that ‘those who welcome the stranger have welcomed the Lord himself and are therefore blessed.’ (Matthew 25:35), and that to ‘do unto others as you would have them do unto you.’ (Matthew 7:12). And that’s just in Matthew’s gospel!” said Curry. On June 6, a federal judge in San Diego refused to dismiss a lawsuit filed by the American Civil Liberties Union challenging the Trump administration’s immigration policy by saying family separation may violate the Constitution’s due process clause. The judge did, however, dismiss a separate challenge saying that the practice violates asylum laws. Entering or attempting to enter the United States illegally, however, and requesting asylum are not one in the same. Under international law, people fleeing violence and persecution have the right to request asylum. The Episcopal Church has a longstanding policy affirming the universal right to seek asylum; it recognizes the need to protect vulnerable people. Last week, Curry signed an ecumenical and interfaith statement expressing concerns over a recent U.S. government policy “calling for more stringent enforcement of federal immigration laws.” A policy, they say, will likely result in an increase in family separations. That the United States would deploy a punitive policy separating families at the border – taking children and not telling their parents where they are going in some cases, not allowing them to say goodbye – to deter asylum seekers is unimaginable, she said, in a phone call with Episcopal News Service. The stories of fathers and mothers being separated from their children at the border are deeply disturbing, said Lacy Broemel, the Episcopal Church’s immigration and refugee policy analyst working out of the Washington, D.C.-based Office of Government Relations, in an email to ENS. “The Office of Government Relations is urging Episcopalians to contact their members of Congress to ask the administration to end this harmful policy of separating families at the border. Our office is sharing the presiding bishop’s statement with members of Congress and meeting with them to share the Episcopal Church’s deep concern about this practice and advocating through the appropriations process to oppose additional funding to detention centers,” she said. 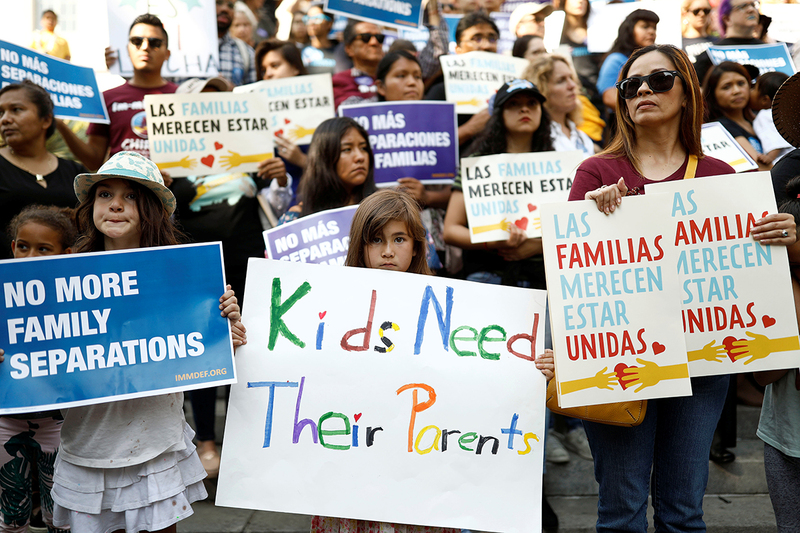 “Further, we are continuing to focus on advocating for larger-scale changes to our immigration policies such as citizenship for Dreamers and other undocumented persons in the U.S., implementing humane and reasonable policies at our border, and addressing the violence and poverty these families are fleeing in their home countries,” said Broemel. Convention will look not only to respond to the current migration crisis, but also to adopt a long-term response strategy in the United States, as well as in places such as the Dominican Republic, where Haitian migrants often suffer abuse, and in areas where climate change threatens to displace entire communities. “The Episcopal Church has a long-standing and well-documented history of championing comprehensive immigration reform as well as humanitarian support for refugees,” said the Rt. Rev. Anne Hodges-Copple, bishop suffragan for the Diocese of North Carolina. “The interest and energy for this work is only increasing as our local communities are continuing to be blessed with new neighbors from others countries. The stories of families torn apart and suffering under the current broken immigration system are the stories of families we know from work, school and church. Earlier this month, Rebecca Linder Blachly, the director of the Office of Government Relations, signed on to an interfaith statement decrying family separation and urging national leaders to protect family unity. To write your elected officials to request they defend access to asylum, click here. In May, the Office of Government Relations hosted a webinar on immigration policies and advocacy titled “Loving Your Neighbor: Faithful Actions on Immigration.” Click here to watch it. — Lynette Wilson is a reporter and managing editor of the Episcopal News Service. She can be reached at lwilson@episcopalchurch.org. With that out of the way, I heartily endorse the thrust of this article. As soon as I have posted this comment, I intend to “click [t]here” to write to my elected officials to request they defend access to asylum. Nice pastoral call out to Ms Wilson! Seems they could have asked to stay in Mexico or the first border after leaving their country if they were afraid. Ever think about that? Empathy yes. But I am sure our readers are well enough informed that there hardly exists a country in this hemisphere that doesn’t have gang violence. Non governmental gang violence subjects our borders to be open to anyone from a country run by thugs. Furthermore non government sponsored domestic violence is something we in the US can not police in other countries. We can’t police it here. How is that working ? Follow up studies will show that some child traders , not relatives of these kids, got their grubby hands on these children. Another unintended consequence of a failed immigration policy. Jim Cutshall has a great idea. Seek asylum in countries near to the ones they are leaving. We, meaning U.S. citizens, cannot support all these people-I am sorry. Moreover, gang violence from South American countries is here in the U.S. The situation of people having to flee their countries is terrible; but rather than add more folks to the U.S., perhaps our churches, if not already, could work to change the conditions in these horrible countries-pressure the source of people’s woes- the governments of those countries. The difficulty of keeping families together is that detention centers are tantamount to federal prisons, except those with and without felony convictions are housed together; men are separated from women; and children go to motels, with a mother usually if they are minor children, or more likely they are not housed; economics are a factor. There is always going to be gang violence in Central and South America. That is never going to end. As desperate as these families may be, this country cannot allow countless thousands of them to come flooding across our borders. Our schools, our clinics and our social services are already strained to the breaking point because of the ones already here. ICE and the AJ are simply enforcing the law. If parents didn’t want to be separated from their children then they shouldn’t have crossed illegally into the country to begin with. Only a progressive would consider enforcment of immigration law to be “cruel and depraved”. Only a progressive would praise and support sanctuary cities whose leftward leaning politicians all but give the Trump administration the middle finger in their defiance of immigration law enforcement. The scary part is Christian progressives see nothing wrong in totally surrendering our sovernty in the name of “compassion”. TEC does not champion immigration reform. It champions open borders. Strict enforcement of immigration law is “cruel and depraved” because many of those immigration laws are “cruel and depraved,” like separating children from their parents. That’s why progressives have tried to get Congress to change those laws. But of course, any time this is suggested, conservatives like yourself accuse us of wanting to offer amnesty and of not following the law. So, which is it? Also, how is it that you can just callously say that immigrants who don’t want their children ripped away from them to just not cross illegally in the first place? First of all, most undocumented immigrants did not cross illegally, but overstayed their visas. Second, people who were following the rules and trying to get in legally have also had their children separated from them. This is a real moral issue with our immigration policy, but you appear to shrug it off as if it is nothing. Is defending the current administration more important to you than caring about the welfare of these children and their families? Standing up for the welfare of immigrants and their children is not a defense of open boarder policy, but about following Our Lord in being compassionate for the least of these. This shouldn’t be a “progressive” vs. “conservative” issue, but a “right” vs. “wrong” issue. I’m not saying that I have all the answers about how to do it (I’m not sure sanctuary cities are ideal, for example), but we need to do something to change our current draconian immigration laws. Zechariah teaches, “The LORD watches over the sojourners; he upholds the widow and the fatherless, but the way of the wicked he brings to ruin.” When government officials violate this statement their acts are wicked and find themselves working against God. It also seems clear that the nation will be judged by the way we treat others: “You have brought your judgment days near and have come to your years of punishment [because] father and mother are treated with contempt, and the foreign resident is exploited within you. The fatherless and widow are oppressed in you,” and this judgment will come because there is no fear of God. Jesus gives the ultimate litmus test, “‘For I was hungry, and you gave Me something to eat; I was thirsty, and you gave Me something to drink; I was a stranger, and you invited Me in; naked, and you clothed Me; I was sick, and you visited Me; I was in prison, and you came to Me.’ Then the righteous will answer Him, ‘Lord, when did we see You hungry, and feed You, or thirsty, and give You something to drink? And when did we see You a stranger, and invite You in, or naked, and clothe You? When did we see You sick, or in prison, and come to You?’ The King will answer and say to them, ‘Truly I say to you, to the extent that you did it to one of these brothers of Mine, even the least of them, you did it to Me’” Matthew 25:35-40 NASB. It is strange that the Federal Government can find money, even more money requested by the Pentagon, but can’t find money for social services and infrastructure. It seems odd that Trump wants to spend more money in Star Wars, but can’t find money for healthcare. There is more than enough money for social services only if there was a will to support them. Such mischievous pictures can significantly weaken efforts to help immigrants. Terry, Larry and others bring up good points but what parents send 32,371 “unaccompanied” children thousands of miles with strangers. In this country the children would removed from the parents by child services. The hope is to establish the children in this country so the parents can later join them. The Border authorities wisely separate the children from the adults not know who’s who and prevent housing them with rapists and pedophiles. I have a friend whose husband entered the United States as a 13-year-old unaccompanied minor from Guatemala. His parents sent him away because they were afraid he was going to be forced into the army and to participate in the murder of indigenous peoples. They knew they could not leave themselves, so they took a chance on saving their son. My friend never saw his parents again because they were murdered by that same army. I have another friend whose parents sent him and sister on a boat from Vietnam because they were afraid he would be forced into the army to fight in Cambodia. He also was only 13. These are the forces that drive parents to take the monumental risks of sending their children away. They just want a chance for them to be safe and free, and they know that with their countries in the shape they are in, that is highly unlikely. Just because we can’t solve all the problems of the world does not mean we cannot act to help the stranger and the alien as we are commanded to do in the Bible. Jesus said it in the parable of the Good Samaritan and Matthew 25:31-46. I would think these passages would be touchstones for any of us who say we are Christians. Americans like to tout their wealth, so it’s ironic that in situations like this, all so many people can do is poor-mouth. This policy of family separation began during the Clinton Administration as a measure to protect children from detained immigrant adults who are violent and predatory. That by itself shows the need to better secure our borders. Secondly, a few General Conventions have come and gone since this policy began. Why the angst now? Is it that MSNBC, CNN, and nearly every news outlet in lockstep has tried to put Trump’s fingerprints on this as though it has just started? No, the current “zero tolerance” policy did not occur under any other previous administration. That is a falsehood perpetuated by the Trump administration to defend its immoral policy. Please stop trying to defend the immoral action of this administration with whataboutisms. Some of the comments here makes mw want to re-think excommunication! Why Didn’t You Speak Out in 2014 and 2015? Please read the ACLU web page. The ACLU sued the Obama administration alleging that the practices regarding these same children and families at the border were inhumane in 2014 and 2015. THAT legal proceeding is where many of the pictures of children in cages come from. Those conditions were in fact dramatically improved under Pres. Trump, though more improvements are needed . So if this were an issue that actually did concern our Bishops and other so-called “religious” leaders –why then did they not hold all of these public vigils and issue such statements back in 2015 ? Could it be that our Bishops and other leaders care more about advancing a Socialist political agenda than advancing the work of God in our World? I submit the answer to that question is self-evident. And opposing this policy is not a support of “socialism,” unless you think the US Conference of Catholic Bishops and the Southern Baptist Convention, which also condemned this policy, are socialist organizations. So where were our Bishops and Church leaders on this issue while this “stain on the Obama administration” was going on? It seems that they were giving this issue a good hard “leaving alone”. Why then all of the outrage now –and none then? Although there may be other possible explanations, when taking into account their other actions as well, logic suggests that they are intentionally infusing Democratic Party talking points into their religious teachings to advance the agenda of the Democratic Party to their unwitting flock. Since objecting to these immigration policies under Obama would have hurt –not helped– the cause of the Democratic Party in the 2016 election, our “religious” leaders deliberately elected to ignore the issue. But as to the issue itself — perhaps there is a reason that even their beloved Saint Obama restarted and then vigorously defended the current policy in numerous appeals. It is important to realize that real families seeking asylum can cross legally at ports of entry, so many illegal crossings at other locations involve children who are accompanied by adults who human traffickers and NOT really their parents. Many so-called parents when questioned separately give conflicting statements as to the children’s birth dates, basic health information, or cannot name the children’s grandparents. But other traffickers are better trained and slip up only after days of more sophisticated questioning. If even one innocent child being accompanied by traffickers can be saved from a life of slavery by not immediately releasing ALL adults accompanied by children just because they falsely claim to be a “family” –is it not worth some inconvenience to those very few real families crossing illegally(who are in any event knowingly breaking the law)? Should the traffickers kidnapping innocent children be rushed through the process and out the door–never to be heard from again –just because a few other, possibly real, families chose to break the law?